Synthetic Lace Front Wigs: What do they cost and how long do they last? What's So Super About Synthetic Lace Front Wigs? If you’ve found this page it’s because you were researching synthetic lace front wigs and we know why. The world of lace wigs can be a confusing one as it’s a rapidly changing world. So get a cup of Chai and relax, we have all the information you need to make sure you choose the right lace front wig for you. Synthetic – relates to the type of hair used not the lace – so the synthetic hair is made of man-made fibres such as nylon and the popular Kanekalon and Toyokalon fibres. Lace front – this means that the lace in the wig is located only at the front of the wig and is usually a few inches in depth. The rest of the wig will have a different cap construction such as wefts, or a stretch material. A synthetic lace wig can be either a full lace wig where the entire cap is made of lace, a lace front wig where the front and sides are made of lace but the rest of the cap is wefts or other material. The few inches of lace at the front and sides, allows for the wearer to part the hair in any direction and maintain an undetectable natural hairline. This means that the lace front wig made with synthetic hair can be worn off the face in a ponytail without anyone realising it’s a wig. Much like human hair lace wigs, not all synthetic hair lace wigs are made equal. Some lace front wigs made with synthetic hair will be heat resistant to around 180 degrees Celsius (that’s 356 in Fahrenheit). A top tip is that even if a synthetic wig is heat resistant, it’s always wise to use the lowest heat setting on your dryer, flat iron or curling tongs as this will prevent your wig from “wearing out” more quickly. Always read the details carefully to find out whether the synthetic hair on the lace front wig you’re buying is heat resistant as heat damage to synthetic hair is irreparable. One of the biggest differences between a lace wig made with synthetic hair and a human hair lace wig is the cost. Lace front wigs made with synthetic hair are usually the least expensive of all lace wigs. Due to the fibres being synthetically made the cost to manufacture is cheaper than the cost of buying, treating and colouring human hair. The manufacturing process is also shortened because the traditional wig ventilation process only takes place at a front and sides. Due to the fibres being synthetic and the ventilation taking part at the front and sides, the price of a lace front wig with synthetic hair depending on where you shop, can be as low as half the price of their human hair lace wig counterparts. A good quality lace front wig that's made from synthetic hair is likely to start at the £65 mark for 18" in length. Just how long will your synthetic lace front wig last? That depends on how often the wig is worn along with how it’s treated. If you follow the basic guidelines of not using heat styling tools and always detangling from tip to root as seen in our synthetic wig care guide then you can expect your wig to last a few months. Obviously if the wig is used less often it will last longer. Synthetic lace wigs, have all the benefits of the traditional lace wig hair colours as well as being able to achieve unique colour options such as pink and red, which are easily achievable because the hair is synthetic. Synthetic lace wigs also have the benefit of being using the same types of lace and same hair textures as those of their human hair counterparts. 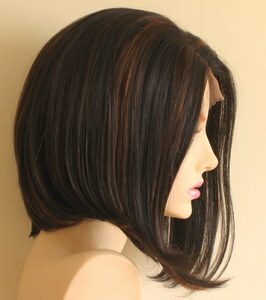 Synthetic lace wigs will keep their textured style after being washed. Synthetic hair lace front wigs are lighter than human hair lace front wigs and will dry more quickly after washing. Caring for a Synthetic wig is relatively simple in comparison to caring for a human hair wig. It’s worth investing in a good quality Silicon to help prevent frizzing. The disadvantage of a lace front wig made with synthetic hair is that even if heat resistant, excessive heat will damage the hair. If what you’re after is a wig that you can teat like real (human) hair then the best thing to do is buy a human hair wig. So there you have it, now you’re in the know about lace front wigs made with synthetic hair. There's more information in the Lace Wig Q&A section or if you'd like to keep up to date with the next guide about hair weave, hair extensions, wigs and hairpieces then join our blog –no personal info required.